MARIJUANA has gone mainstream. We’ve yet to see weed adverts on the side of F1 vehicles, as we have for cigarettes and booze, but NASCAR fans heading to the 2013 Brickyard 400 races at the Indianapolis Motor Speedway will get to see a TV advert hailing cannabis. Created by the Marijuana Policy Project, the message is that marijuana is the new, lo-cal, hangover-free, wife-beating-negative beer. Photo: Bobby Allison poses at New York’s Waldorf Astoria hotel with the Winston Cup trophy, Dec. 8, 1983. Allison, winning his first Winston Cup will receive $150,000 from the R.J. Reynolds Tobacco Co., which sponsors the NASCAR series. via Anorak | Adverts tells NASCAR fans to buy hangover-free, lo-cal marijuana not beer. via Dutch City of Rotterdam Bans Monsanto Glyphosate Roundup Herbicide | Global Research. “They’re a pesticide company that’s bought up seed firms,” says Bill Freese, of the Center for Food Safety. 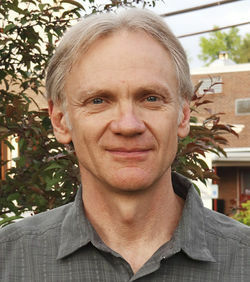 Research professor Dr. Charles Benbrook found that rapidly increasing seed and pesticide costs were tamping farmers’ income. 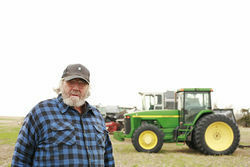 “Monsanto and the biotechs need to… keep their pollution on their side of the fence,” says Maine farmer Jim Gerritsen. Schmeiser’s case illustrates how Monsanto is dominating — and terrifying — the agricultural world with secretive technologies, strong-arm tactics, and government approval. According to the Center for Food Safety, Monsanto has filed at least 142 similar lawsuits against farmers for alleged infringement of its patents or abuse of its technology agreement. The company has won 72 judgments totaling almost $24 million. Agriculture is a big industry in Florida. About $130 billion-per-year big, the second-largest industry behind tourism. Statewide, 9 million acres of farmland are divided into more than 47,500 commercial farms. In fact, Palm Beach County is the largest agricultural county east of the Mississippi River. According to the USDA, 95,000 acres of corn, 125,000 acres of upland cotton, and 25,000 acres of soybeans have been planted in the state in 2013. With Food and Water Watch warning that nationally, 90 to 93 percent of such crops are genetically modified, Floridians have cause to know what’s lurking up the food chain. When you’re good at something, you want to leverage that. Monsanto’s specialty is killing stuff. In the early years, the St. Louis biotech giant helped pioneer such leading chemicals as DDT, PCBs, and Agent Orange. Unfortunately, these breakthroughs had a tendency to harm humans too. When lawsuits piled up, putting a crimp in long-term profitability, Monsanto hatched a less lethal, more lucrative plan. It would attempt to take control of the world’s food supply. 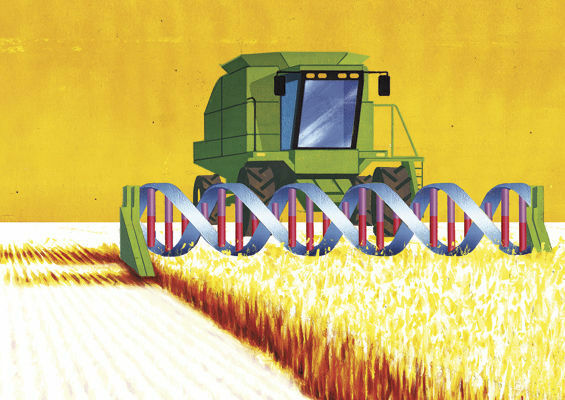 This mission started in the mid-’90s, when the company began developing genetically modified crops like soybeans, corn, alfalfa, sugar beets, and wheat (much of it used for livestock feed). Monsanto bred crops that were immune to its leading weed killer, Roundup. That meant farmers no longer had to till the land to kill weeds, as they’d done for hundreds of years. They could simply blast their fields with chemicals. The weeds would die while the crops grew unaffected. Problem solved. Monsanto put a wonderful spin on this development: The so-called “No-Till Revolution” promised greater yields, better profits for the family farm, and a heightened ability to feed a growing world. But there was a dark side. First, farmers grew dependent on Monsanto, having to buy new seed every year, along with Monsanto’s pesticides. The effects on human health were largely unknown — would it harm people to consume foods whose genetic profile had suddenly changed after millions of years? Or to eat the animals that had consumed those plants? What about ripple effects on ecosystems? But agriculture had placed the belligerent strongman in charge of the buffet line. Monsanto squeezed out competitors by buying the biggest seed companies, spending $12 billion on the splurge. The company bought up the best shelf space and distribution channels. Its braying of global benevolence began to look much more like a naked power grab. Instead of feeding the world, Monsanto drove prices through the roof — taking the biggest share for itself. A study by Dr. Charles Benbrook at Washington State University found that rapidly increasing seed and pesticide costs were tamping farmers’ income, cutting them from any benefits of the new technology. Still, Monsanto was doing its best to make them play along. It offered steep discounts to independent dealers willing to restrict themselves to selling mostly Monsanto products. These same contracts brought severe punishment if independents ever sold out to a rival. U.S. regulators showed little concern for Monsanto’s expanding power. Today, Monsanto seeds cover 40 percent of America’s crop acres — and 27 percent worldwide. The company makes nearly $8 billion per year. “If you put control over plant and genetic resources into the hands of the private sector… and anybody thinks that plant breeding is still going to be used to solve society’s real problems and to advance food security, I have a bridge to sell them,” says Benbrook. It didn’t used to be like this. At one time, seed companies were just large-scale farmers who grew various strains for next year’s crop. Most of the innovative hybrids and cross-breeding was done the old-fashioned way at public universities. The results were shared publicly. The first crack appeared in 1970, when Congress empowered the USDA to grant exclusive marketing rights to novel strains — with the exception that farmers could replant the seeds if they chose and patented varieties must be provided to researchers. But that wasn’t enough. Corporations wanted more control, and they got it with a dramatic, landmark U.S. Supreme Court decision in 1980 that allowed the patenting of living organisms. The decision was intended to increase research and innovation. But it did the opposite, encouraging market concentration. Monsanto, which declined an interview request for this article, would soon gobble up every rival seed company in sight. It patented the best seeds for genetic engineering, leaving only the inferior for sale as non-GM brands. Historically, farmers were able to save money on seeds by using those produced by last year’s crops for the coming year’s planting. But because Monsanto owns patents on its genetically modified strains, it forces farmers to buy new seeds every year. Armed with lawyers and private investigators, the company has embarked on a campaign of spying and intimidation to stop any farmer from replanting his seeds. Farmers call them the “seed police,” using words such as “Gestapo” and “Mafia” to describe Monsanto’s tactics. The company’s agents fan out into small towns, where they secretly videotape and photograph farmers, store owners, and co-ops; infiltrate community meetings; and gather information from informants. Some Monsanto agents pretend to be surveyors. Others confront farmers on their land and try to pressure them to sign papers giving Monsanto access to their private records. In one case, Monsanto accused Indiana farmer David Runyon of using its soybean seeds, despite documented fact that he’d bought nonpatented seed from local universities for years. While attempting to pressure Runyon, Monsanto’s lawyer claimed the company had an agreement with the Indiana Department of Agriculture to search his land. One problem: Indiana didn’t have a Department of Agriculture at the time. Like most Monsanto investigations, the case never went to trial and would appear to be more about intimidation than anything. Runyon incurred substantial costs defending himself without having done anything wrong. In 2006, the Center for Food Safety estimated that Monsanto had pressured as many as 4,500 farmers into paying settlements worth as much as $160 million. Yet Monsanto wanted even more leverage. So it naturally turned to Congress. Not that Congress noticed. Monsanto’s spent more than $10 million on campaign contributions during the past decade — plus another $70 million on lobbying since 1998. The money speaks so loudly, Congress has become tone-deaf. In fact, the U.S. government has become Monsanto’s de facto lobbyist in countries distrustful of GM safety. Two years ago, WikiLeaks released diplomatic cables showing how the feds had lobbied foreign governments to weaken laws and encourage the planting of genetically modified crops in Third World countries. Other wires from State Department diplomats ask for money to fly in corporate flacks to lean on government officials. Even Mr. Environment, former Vice President Al Gore, was key in getting France to briefly approve Monsanto’s GM corn. But the real coup came in 2010, when President Obama appointed former Monsanto Vice President Michael Taylor as the FDA’s new deputy commissioner for foods. It was akin to making George Zimmerman the czar of gun safety. Trust Us. Why Would We Lie? At the same time Monsanto was cornering the food supply, its principal products — GM crops — were receiving less scrutiny than an NSA contractor. Monsanto understood early on the best way to stave off bad publicity was to suppress independent research. Until recently, when negotiating an agreement with major universities, the company had severely restricted access to its seeds by requiring researchers to apply for a license and get approval from the company about any proposed research. The documentary Scientists Under Attack: Genetic Engineering in the Magnetic Field of Money noted that nearly 95 percent of genetic engineering research is paid for and controlled by corporations like Monsanto. Meanwhile, former employees embedded in government make sure the feds never get too nosy. Meet Michael Taylor. He’s gone back and forth from government to Monsanto enough times that it’s not a revolving door; it’s a Bat-pole. During an early-’90s stint with the FDA, he helped usher bovine growth hormone milk into the food supply and wrote the decision that kept the government out of Monsanto’s GM crop business. Known as “substantial equivalence,” this policy declared that genetically modified products are essentially the same as their non-GM counterparts — and therefore require no additional labeling, food safety, or toxicity tests. Never mind that no accepted science backed his theory. Part of the blame belongs to a monoculture that developed around farming. Farmers know it’s better to rotate the crops and pesticides and leave fields fallow for a season. But when corn prices are high, who wants to grow a less profitable crop? The result’s been soil degradation, relatively static yields, and an epidemic of weed and insect resistance. Nature, as it’s proved so often before, will not be easily vanquished. Pests like Roundup-resistant pigweed can grow thick as your arm and more than six feet high, requiring removal by hand. Many farmers simply abandon fields that have been infested with it. Pigweed has infested Florida cotton fields, and farmers are now using old pesticides on top of Roundup to combat it. The biggest problem for Monsanto’s global growth: It doesn’t have the same juice with foreign governments as it does with ours. That’s why it relies on the State Department to work as its taxpayer-funded lobbyist abroad. Yet that’s becoming increasingly difficult. Other nations aren’t as willing to play corporate water boy as America is. The countries that need GM seeds often can’t afford them (or don’t trust Monsanto). And the nations that can afford them (other than us) don’t really want them (or don’t trust Monsanto). Though the European Union imports 30 million tons of GM crops annually for livestock feed, it’s approved only two GM crops for human consumption. Although Brazil is poised to become the world’s largest soybean exporter on the strength of Monsanto seed, thousands of farmers there are suing Monsanto for more than $600 million after the company continued to charge them royalties two years after the expiration of its patent. Ecuador and Peru have shied away from GM crops. And even in the wake of the 2010 earthquake, Haiti mistrusted Monsanto so much that it declined its offer of seeds, even with assurances that the seed wasn’t GM. In April, biotech companies took another hit when the European Union banned neonicotinoids — AKA “neo-nics” — one of the most powerful and popular insecticides in the world. It’s a derivative of nicotine that’s quite poisonous to plants and insects. German giant Bayer CropScience and Syngenta both make neo-nics, which are used to coat seeds, protecting crops in their early growth stage. In America, 90 percent of America’s corn crop comes with the coating. The problem is that plants sweat these chemicals out in the morning dew, where they’re picked up by bees like a morning cup of Starbucks. Last year, a study linked neo-nics to the collapse of bee colonies, which threatens the entire food system. One-quarter of the human diet is pollinated by bees. Last year’s study indicates a link to Monsanto’s GM corn, which has been widely treated with neo-nics since 2005. But while other countries run from the problem, the U.S. government is content to let its citizens serve as guinea pigs. Beekeepers, though, are starting to fight back. This year, two separate lawsuits have been filed against the EPA demanding a more stringent risk assessment process and labeling laws for pesticides. The same worries apply to contamination from GM crops. 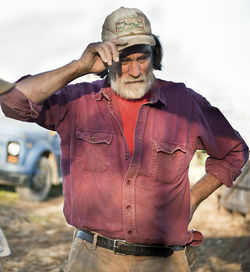 Ask Frank Morton, who grows organic sugar beet seeds in Oregon’s Willamette Valley and is among the few non-GM holdouts. In 2010, a federal judge demanded farmers stop planting GM sugar beets. Farmers were surprised to find there was very little non-GM sugar-beet seed to be had. Since being introduced in 2005, Monsanto had driven just about everyone out of the market. Morton’s farm is just two miles from a GM sugar beet farm. Unfortunately, beet pollen can travel as much as five miles, cross-pollinating other farmers’ fields and, in the case of an organic farmer, threatening his ability to sell his crop as organic and GM-free. 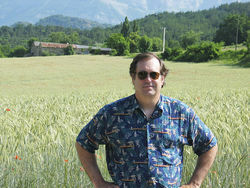 Morton has to worry about his fields because GM crops have perverted long-standing property law. Organic farmers are responsible for protecting their farms from contamination, since courts have consistently refused to hold GM growers liable. Contamination isn’t just about boutique organic brands. It maims U.S. exports too. Take Bayer, which grew experimental, GM rice — that was unapproved for cultivation and for human consumption — at test plots around Louisiana State University for just one year. Within five years, these test plots had contaminated 30 percent of U.S. rice acreage. No one’s certain how it happened, but Bayer’s rice was found as far away as Central America and Africa. Within days of the USDA announcement that this untested GM rice had gotten loose, rice futures lost $150 million in value, while U.S. rice exports dropped by 20 percent during the next year. And Bayer ended up paying farmers $750 million in damages. Last month brought another hit. A Monsanto test of GM wheat mysteriously contaminated an Oregon farm eight years after the test was shut down. Japan and South Korea immediately halted imports of U.S. soft white wheat — a particularly harsh pill for the Japanese, who have used our white wheat in almost all cakes and confectionary since the 1960s. Monsanto’s response? It’s blaming the whole mess on eco-terrorists. Trish Sheldon moved to Florida in 2001, but the bubbly blond still exudes a cool, friendly California air. 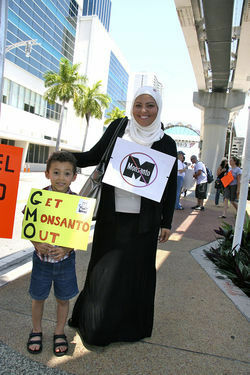 In 2010, she started a state chapter of Millions Against Monsanto, then in 2011 founded a group called GMO-Free Florida to raise awareness of the risks of GMOs and push for mandatory labeling initiatives. With Monsanto seeds covering more than 40 percent of America’s crop acres (a March study found that 86 percent of corn, 88 percent of cotton, and 93 percent of soybeans grown here are of a GM variety) and the agri-giant making an expected $7.65 billion profit this year, it’s doubtful the company will go away anytime soon. But as consumers become more aware of the sinister problems lurking in the food chain, activists in many states are pushing for laws that would require foods with GM ingredients to be labeled, much as foods with trans fats are. More than 23 right-to-know groups have since popped up throughout Florida especially after California’s push for mandatory labeling legislation, called Proposition 37, failed last year. Chemical companies defeated the initiative, thanks to a $46 million publicity campaign full of deceptive statements. “Even though there were lies and deceit by the biotech industry, that was the catalyst,” Sheldon says. “People were so pissed off that it failed [and] we started gaining steam.” This May, during a global day of action, more than 2 million protesters attended rallies in more than 400 cities across 52 countries. In Miami, organizers lost count when protesters topped 1,300. Maine is just the second state (nine days after Connecticut) to pass such a law. When Vermont raised the issue a year ago, a Monsanto official indicated the company might sue. So the new laws in both Maine and Connecticut won’t take effect until other states pass similar legislation so they can share defense costs. In Florida, state Sen. Maria Lorts Sachs and House Rep. Michelle Rehwinkel-Vasilinda have sponsored similar bills — but neither version made it to committee. Both intend to revise and resubmit bills in the next legislative session, in January 2014. As more information comes out, it’s increasingly clear that GM seed isn’t the home run it’s portrayed to be. It encourages greater pesticide use, which has a negative impact on the environment and our bodies. Whether or not GM food is safe to eat, it poses a real threat to biodiversity through monopolization of the seed industry and the kind of industrial farming monoculture this inspires. Providing we don’t irreparably break it first. Additional reporting by Sara Ventiera. Is corporate power pushing Americans over the edge? Americans are now more likely to die by their own hands than from a car accident or a murder-related incident, a grim statistic that shines a light on abusive corporate practices. Judging by the latest data by the Center for Disease Control, something is driving Americans to become their own worst enemies: From 1999 to 2010, the suicide rate among US citizens between the ages of 35 to 64 soared by about 30 per cent, to 17.6 deaths per 100,000 people. Suicide now ranks higher than death by automobile: in 2010, there were 33,687 deaths from motor vehicle crashes compared with 38,364 suicides. Although suicide tends to be viewed as a problem inflicting teenagers and the elderly, the recent study shows a marked rise in the number of suicides among the Baby Boom generation (a demographic group born between the years 1946 and 1964, when the annual birthrate rose dramatically in the US). Suicide rates soared across all four geographic areas and in 39 states. The state of Wyoming recorded the highest increase in suicides with a 78.8 per cent jump (31.1 per 100,000). Even the paradise state of Hawaii witnessed a 61.2 per cent increase (21.9 per 100,000). Yet some believe even these shocking numbers are too low since many deaths are not treated as actual suicides. What’s going on here? What is suddenly pushing so many Americans to take their own lives? The striking thing about the data is that the suicide rates really began to surge just as the Global Financial Crisis was making landfall in late 2008. While suicide rates increased slowly between 1999 and 2007, the rate of increase more than quadrupled from 2008 to 2010. “There is a clear need to implement policies to promote mental health resilience during the ongoing recession,” said Aaron Reeves of Britain’s University of Cambridge, who submitted his findings to The Lancet medical journal. Reeves went so far as to suggest that the Democrats and Republicans are partially to blame for failing to mention the issue during the latest presidential campaign. “In the run-up to the US presidential election, President Obama and Mitt Romney are debating how best to spur economic recovery, [but] missing from this discussion is consideration of how to protect Americans’ health during these hard times,” Reeves warned. So what else is responsible for driving up American suicide rates? Could it be the loss of democratic representation inside our corporate fortresses, those medieval-style fiefdoms that are now working overtime to control the US political process as well? Thanks largely to the passage of the Citizens United vs. Federal Election Commission ruling (2010), transnational corporations are now entitled to donate unlimited amounts of hard cash to the political campaign of their choice without having to come clean on the expenditures. The ruling even applies to foreign corporations! So great is the corporate footprint in the halls of power that I fear the day is close at hand when we will actually see a corporation make a run for political office. Why not? They have already been designated as bona fide individuals by our craven Supreme Court (In the book, “Unequal Protection,” Thom Hartmann persuasively explains how the 1886 US Supreme Court decision in Santa Clara County v. Southern Pacific Railroad Company case wrongfully granted corporations personhood). As for traditional benefits such as pensions, bonuses, sick leave and paid vacations, forget about it. Most of those have been abolished, Macaray added. Did somebody mention a vacation? Despite all the hyped-up talk about freedom and liberty, American workers receive the stingiest vacation packages in the free – and oppressed – world. That is not because Americans have some sort of masochistic attachment to their desks, as some like to argue, but rather because we lack any sort of labor law that forces corporations to remove our chains more than once a year. Incredibly, the United States is the only country in the world where corporations are under no legal obligation to provide their workers with a break from their jobs. Compare that sad statistic with any other country in the world, even the most totalitarian. This Scrooge mentality must change, or all of our boastful talk about democracy and freedom will be revealed as nothing more than a diversionary smokescreen to conceal what can only be described as an attack on human rights. Why is it that other countries can readily afford to give their people a break from their jobs and still maintain high living standards? “Germany is among more than two dozen industrialized countries from Australia to Slovenia to Japan – that require employers to offer four weeks or more of paid vacation to their workers, according to a 2009 study by the human resources consulting company Mercer,” reported CNN. Still other countries, including Finland, Brazil and France, guarantee their workers up to six weeks off. It seems fair to ask whether America’s lack of time away from the office is contributing to high stress levels and even sporadic episodes of domestic and workplace violence, up to and including suicide. Shouldn’t the world’s most heavily armed and medicated nation allow its people to hit the beach more than once a year? This question brings us back to the issue of democratic representation in the workplace, which is presently missing in action. Although organized labor is itself fraught with problems, it is nevertheless the last line of defense when it comes to protecting US workers against the insatiable greed of the corporate overlords. Thus, it should come as no surprise that US wages have been plummeting over the last 30 years at the very same time that unions are being decimated. The total number of union workers fell by 400,000 last year, to 14.3 million, even though the nation’s overall employment rose by 2.4 million, according to data from the Bureau of Labor Statistics. Just 11.3 per cent of the US workforce is enrolled in a union, the lowest recorded levels since 1916, when it was 11.2 percent, according to a study by two Rutgers economists, Leo Troy and Neil Sheflin, as reported in The New York Times. Never before has the wealth divide been greater in the United States, a land that was built on the foundation of opportunity. Between 2009 and 2011, the top 7 per cent of wealthy Americans saw their average net worth explode by 28 per cent, while the wealth of the remaining 93 per cent of the population steadily declined during the same period, according to a study by the Pew Research Center. The average net worth of the country’s 8 million wealthiest households surged from an estimated $2.7 million to $3.2 million, the Pew study said. For the 111 million households that make up the bottom 93 per cent, average net worth plunged 4 per cent, from $140,000 to an estimated $134,000. In 2010, the first supposed year of economic recovery, 93 per cent of all pre-tax income gains went to the top 1 per cent of the American population (that is, any household earning more than $358,000). Meanwhile, the most affluent 7 per cent of households owned 63 per cent of the nation’s household wealth in 2011, up from 56 per cent in 2009. These mind-numbing statistics are a mere reflection of millions of individual cases of pain and suffering wrought by the economic crisis, which seems to have only affected the middle and lower classes. One consequence of the economic fallout is the record number of foreclosures on homes. Since 2007, almost 4 million homes have been lost in the foreclosure crisis, according to Forbes. At the same time, US home prices – except in the most affluent neighborhoods – remain essentially flat. On top of this pummeling, Americans must digest the incredible news that many US corporations, some of which were rescued by taxpayer-funded bailout, are not paying any taxes on their earnings. General Electric, for example, reported global profits of $14.2 billion for the year 2010, with $5.1 billion of the total deriving from its operations in the United States. So how much did the granddaddy of US corporations pay in taxes to Uncle Sam? Nothing. Nada. Zilch. In fact, GE actually claimed a tax benefit of $3.2 billion. How was GE able to pull off that disappearing act? “Its extraordinary success is based on an aggressive strategy that mixes fierce lobbying for tax breaks and innovative accounting that enables it to concentrate its profits offshore,” tooted The New York Times. Is the rash of suicides across a broad spectrum of the American population a direct result of the wealth hoarding by the top income earners – many of them US corporate ‘individuals’? Since it is clear that Monsters Inc. have all but hijacked the American dream, not to mention the US political process, the evidence seems to point in that dark direction. Clearly it is time for the United States to tame the beast of corporate power, and as was the case with the separation of church and state, we must prohibit business from unduly influencing our political leaders. Our government representation is a precious and limited resource. It cannot be allowed to be squandered on entities that are already enjoying great wealth and power as it is. via Is corporate power pushing Americans over the edge? | EUTimes.net. Why connect public health with austerity? Basu: In the 1990s, there was an astounding series of studies that said, What if everybody had perfect health insurance? How many premature deaths in the U.S. among people less than 75 years of age could we prevent? And it turned out that the answer was only about 15 to 20 percent. The other 80 to 85 percent can’t be affected by medical care, meaning that health doesn’t start on the exam table in the ICU, but in our homes, in our neighborhoods, whether we smoke or drink too much, and the quality of our air, food and safety. One of the biggest determinants therein is the state of the economy and, in particular, whether we have safety nets during hard times. How does austerity lead to a loss of life? Stuckler: When effective services and supports that sustain health are withdrawn, they pose a direct risk. A clear example can be seen in Greece today. To meet the deficit reduction targets, the health sector in Greece has been cut by more than 40 percent. HIV infections have more than doubled as effective needle exchange program budgets were cut in half. There was a return of malaria after mosquito spraying programs to prevent the disease were also cut, covering the southern part of the country. Deep reductions of a pharmaceutical budget led several pharmaceutical companies to leave the country. There was subsequently a 50 percent increase in people reporting being unable to access medically necessary care. Basu: That there are some very well-researched, effective programs out there that can benefit both public health and the economy, but the academic research is so far afield from the public discourse. A lot of the discourse just assumes that the only way to reduce deficits is to cut budgets in the short term, and it’s quite hard to explain why that’s a bad idea and actually increases long-term budgets. That counterintuitive problem has created a lot of fallacies and makes it difficult to translate research into practice. Do you expect to see public health consequences to spending cuts in the U.S.? Basu: We already see them if we compare state-based responses to different kinds of unemployment crises since 2007. We can, controlling for pre-existing conditions, compare states that underwent more extensive budget cuts versus those that didn’t; and [we] saw a rise in suicide among those who were denied unemployment benefits. Which current policies are most harmful to public health? Basu: I think the indiscriminate cuts to safety net programs among the poor are particularly easy to implement and particularly dangerous for public health. [And] cuts to our nation’s best defense system against epidemics, the Centers for Disease Control [and Prevention] are particularly dangerous. We recently had the fungal meningitis outbreak, and without the CDC, it would’ve been hard to conceive of how we would’ve protected ourselves from having a dramatic expansion of that epidemic. Are there any economic policies that don’t have daunting human costs? Basu: In many areas of the world, we see pretty effective policies that simultaneously improve health and the economy. For example, in Sweden and Finland there are active labor market programs. They help enroll the newly unemployed into supportive job retraining and re-entry, and work with both firms and the newly unemployed. As a side effect, they seem to reduce suicide, depression and alcoholism, while also stimulating the economy and being, in some cases, net cost-saving. Why should President Obama read your book? Stuckler: The book shows that there is an alternative to austerity that’s grounded in evidence. And when governments pursue it, they can pave the way to a happier and healthier future for people. By making smart, evidence-based investments, not only is it possible to protect people’s most valuable asset – their health – but to chart faster economic recoveries and address fundamental threats of deficits and debt. A simple answer is because his choices and those of Congress are matters of life and death for millions of Americans. via The Negative Impact of Austerity on Public Health – US News and World Report. Did You Know About Monsanto Video Revolt On July 24, 2013? 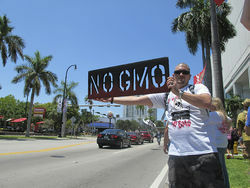 The fight against Monsanto Company, the leading producer of Genetically Engineered Seeds in the world, continues as another major ‘video’ protest has been planned for July 24, 2013. On May 27 this year, almost two million people in 436 cities across the world marched against what they believe is ‘corporate greed’ and an attack on human health. Increasing information about the adverse effects of Genetically Modified Organisms (GMOs) has left people appalled and outraged, however, it has had no effect on the growth and profits of the companies that are manufacturing these products. Step 1 – Create a video of any length detailing why you stand against Monsanto and GMOs at large. The video can be as long as you want – it’s your choice. Step 2 – Upload your video to major video websites like YouTube, Vimeo, LiveLeak, DailyMotion, NaturalNews.TV (where it will not be censored), etc.). Step 3 – Spread the word about Monsanto and be the final stake in their vampire heart. Share your video any way possible, through Facebook, Twitter, or any other platform you can think of. Do you have a video planned for the protest? Do share it with us. The judge has allowed time for the woman to take legal advice. The Irish high court has been asked to order a psychiatric assessment of a young woman to establish if she is travelling to the UK for an abortion against her will. The woman’s boyfriend claims she is being forced to have an abortion by her parents. The judge said she would not proceed until the woman had received legal advice. The boyfriend has applied for injunctions to prevent the woman from having an abortion or travelling outside the country. He says his girlfriend’s family are unhappy with the fact she is in a relationship with someone of non-European origin. The couple are not Irish citizens but live in Ireland. The man’s lawyer said his client discovered that his girlfriend has been booked into a clinic in the UK and was due to have an abortion on Thursday. In a sworn statement, the man told the court that his girlfriend was “happy to be pregnant” was looking forward to having a scan and had bought baby clothes. The man said he had no desire to prevent her from travelling if it was of her own free will, and that a member of the girlfriend’s family had threatened to kill him if he tried to come near her. 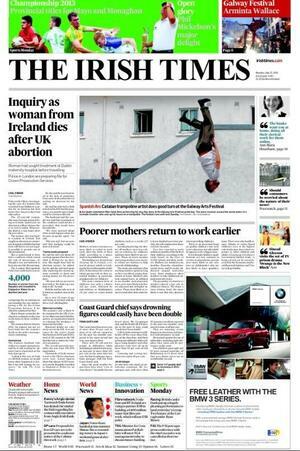 via BBC News – Irish court told woman ‘being forced to have abortion’.